After having been exposed to the Goblin Formula, Norman Osborn is poised to unite and rule the New York City organized crime syndicates. Is it unlikely that a businessman would be able to make the jump to crime boss so easily? No, not for Norman. A combination of his already "questionable" business ethics and his longstanding involvement in the chemical industry no doubt left him with the connections and the "know how" of how and when to strike. Another possible explanation for Norman's facile transition into super villain status is presented in Marvel Knights Spider-Man #9. In that story, Mac Gargan (aka the Scorpion aka Venom II) tells Peter Parker the history of super villains. He states that they were created in the forties when the “ruling class”, that is, companies responsible for putting governments into office, desired to keep emerging super heroes at bay. This "ruling class" did not want the super heroes to uncover their corrupt actions, so they employed super villains to keep the heroes occupied. 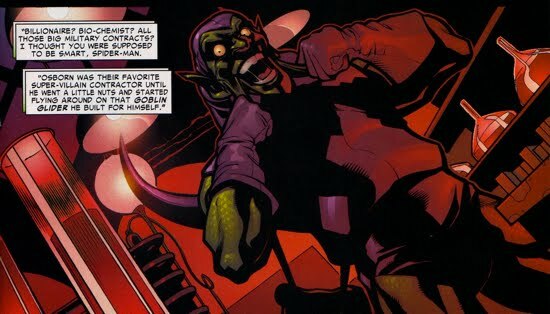 Norman Osborn was one of the cabal's favorites, until he "went out of control with the Goblin persona". It is unclear exactly when and how this fits into Norman’s early escapades as the Goblin, but with all of the super-criminal alliances he was forming, it is possible that some of these connections were made through this “ruling class” cabal. Of course Mac Gargan was also involved in some of the shady dealings that occurred early on in Norman's professional career. As Norman was out hiring thugs to help amass his weapons arsenal, it appears as though people were out to get him as well. 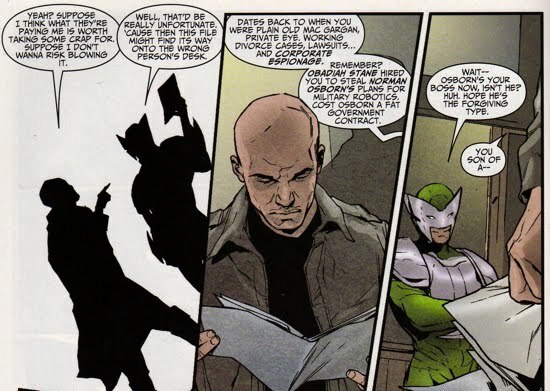 Obadiah Stane had hired Gargan to steal Osborn's plans for military robotics; plans that would have led to a lucrative government contract. Osborn did not get the contract, whilst Stane most likely did. This information was brought to light as a retcon in the one-shot Thunderbolts: Reason in Madness. Gargan came clean to Osborn regarding his work for Stane, Norman forgave Mac and deemed it 'water under the bridge.' Interestingly, Norman also mentions that losing that government contract pushed him into researching biological enhancements. Norman added, "and we see where that led." Most likely Norman is referring to the Goblin Formula and related ventures, but in reality we know that Mendel Stromm created the formula and Norman basically stole it from him. 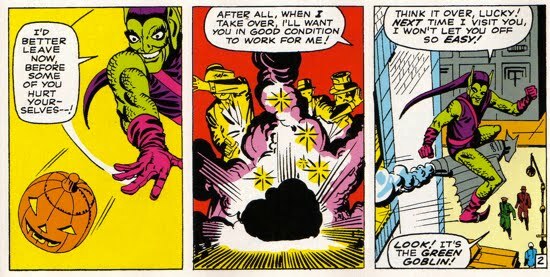 Another early account of Norman's conflicts before donning the Goblin attire is depicted in Tales of the Marvels: Inner Demons, which takes place around the time of the events of Fantastic Four #1-4. Although it is not specifically stated, it is probably Norman’s first “post explosion” appearance. In this story, Osborn comes into conflict with the still amnesiac and homeless Namor when he trashes some machinery at one of Norman’s businesses. At this point, Norman already has the public reputation as a ruthless businessman and a close affiliation with the hired goons known as the Enforcers. When Namor’s companion, an “off the wagon” street vagrant named John, returns to their crime scene to remove his fingerprints, Norman is there waiting for him. The Enforcers beat him to within inches of his life in effort to find out who was responsible for these actions against Osborn. John doesn’t rat out Namor and Norman and his crew leave the alcoholic for dead. Norman's endeavors toward assuming the mantle of New York City's head criminal are chronicled as interwoven stories featured in the longstanding Amazing Spider-Man title and the retcon series Untold Tales of Spider-Man. After working alongside the Enforcers, Norman began hiring criminals to help him amass his deadly arsenal. In Untold Tales of Spider-Man #1, Spider-Man inadvertently screws up a sting operation that may have led to Norman's capture, or at least his exposure as a villain. After Norman had hired the Scorcher to steal weapons and electronic plans, Spider-Man was able to intervene and detain the Scorcher. Norman, meanwhile, still managed to make off with the stolen plans. The police had deliberately left a hole in their cordon so that the Scorcher could escape and lead them to their mastermind. Spider-Man prevented that, and thus Norman was able to continue operating in the shadows. In Amazing Spider-Man #10, Spider-Man defeats the Enforcers and unmasks Frederick Foswell as the Big Man. In the retconned story from Untold Tales of Spider-Man #8, Norman realizes that with the Big Man out of commission, this may be the optimal time to make his move. Norman sends the Headsman to take out Spider-Man, because Norman feels that Spider-Man is going to be disruptive to his plans. Spider-Man defeats the Headsman and the Enforcers as well. At this point, Norman has the Scorcher, the Enforcers and the Headsman working for him. 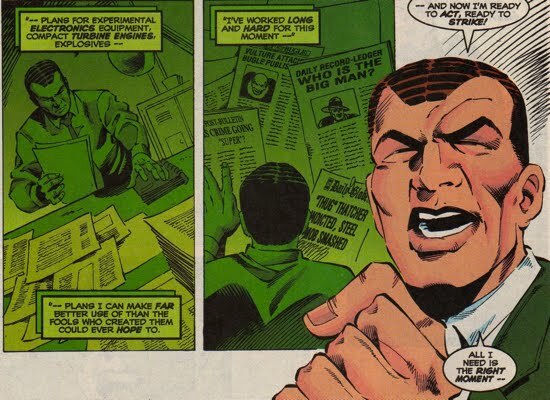 He has hired the Scorcher specifically to steal more plans for electronics equipment, turbine engines, and explosives so that Osborn can use them for his desires. However, Norman is infuriated by the failure of his associates and resolves to handling the problem himself. At the end of Untold Tales of Spider-Man #8, Norman is seen having sketched the mask for his Goblin persona. Soon after, Osborn creates the identity of the Green Goblin, based on the monster he feared in his childhood. His arsenal of weapons includes a personal flying device, which eventually evolves into his iconic Goblin Glider. He also develops hand grenade-like explosive weapons resembling pumpkins, sharp razor-bat projectiles, and gloves that fire blasts of energy from the fingertips. Admittedly, there are other weapons that Norman used early on but they are just too goofy to mention here. Amazing Spider-Man #14, which is the first official comic book appearance of the Green Goblin, marks the first direct conflict between Spider-Man and the Green Goblin. In this story, the Goblin convinces Hollywood movie executive B.J. Cosmos that he can get Spider-man and they would then be able to make a movie with him. 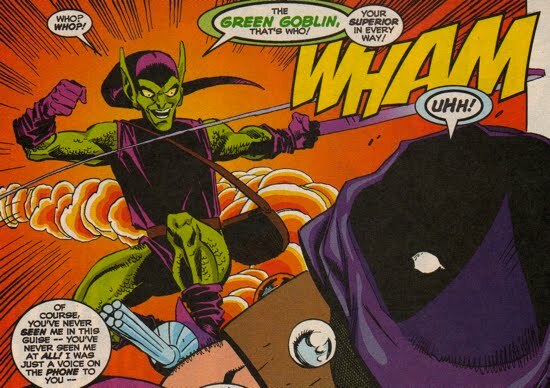 The Goblin enlists the help of the Enforcers for his trap, since they were recently defeated by Spider-Man and they were already associates of Osborn. Spider-Man, the Green Goblin, and the Enforcers go to New Mexico to film this faux-movie. During a "rehearsal", Spider-Man is attacked by the group and their fight eventually leads them to cross paths with the Incredible Hulk. The Hulk was hiding out in a cave in New Mexico trying to seek solitude. The Green Goblin escapes while Spider-Man is distracted by the Hulk and the Enforcers. Interestingly, the Goblin thinks himself victorious over Spider-Man since the web-slinger had seemingly disappeared mid-battle, he then returned safely to NYC aboard his trusty flying broom-stick. Returning now to the Untold Tales, we see that in Untold Tales of Spider-Man #18, the Green Goblin approaches Lucky Lobo and claims to be able to take out Spider-Man and the Headsman. While Spider-Man struggles against the Headsman, the Goblin easily defeats the Headsman claiming that he had been given technology by the Goblin and he failed when using it. Spider-Man is unaware that it is the Green Goblin who has defeated the Headsman. This story leads into Amazing Spider-Man #17, where after defeating a robotic Spider-Man, the Goblin feels he’s ready to challenge the real Spider-Man and defeat him. He chooses to attack Spider-Man at the first meeting of the Spider-Man Fan Club. The Human Torch interrupts the fight, but the Goblin evades him and escapes before being caught. Spider-Man bails out of the fight because he hears that his Aunt May has suffered a heart attack. Spider-Man was branded a coward after he fled the battle with the Goblin in order to be with his Aunt May. As expected, J. Jonah Jameson took great pleasure in Spidey's new label. 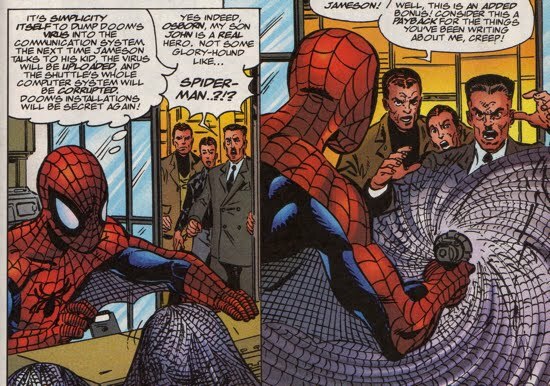 In Untold Tales of Spider-Man #20, Osborn catches Jameson gloating about Spider-Man and warns him about the affect on the Daily Bugle's sales if the web-slinger were to disappear. Jonah was caught off-guard and Norman had his own reasons for smiling too, he was the one responsible for Spidey's new rep! As the Green Goblin, Norman continues to try and establish alliances with other criminals. In Untold Tales of Spider-Man #22, the Goblin confers with the Scarecrow and offers an alliance with him as he, the Green Goblin, unites the underworld. The Scarecrow refuses to be his ally. Unphased by the Scarecrow's denial, the Green Goblin sets his sights on Lucky Lobo, another known mob boss. While Norman is manipulating his way through the criminal underworld, he also becomes distracted with an employee of the Osborn Chemical Company named David Lowell. Through his research on a photogenesis project, Lowell stumbles upon a chemical compound that is structurally similar to the Goblin Formula. Norman orders Lowell to cease his research in this area, fearing that he will stumble upon the Goblin Formula as well. To see how Lowell contributes to the history of the Goblin Formula check out the Origin of the Goblin Formula page. In Amazing Spider-Man #23, the Goblin confronts Lobo and requests that he hand over the leadership of his criminal operations to him. Lucky refuses. The Green Goblin then exposes Lucky to the public and the police raid Lucky’s establishments. Spider-Man sees this and he tails the Goblin who is going after Lucky. Spider-Man takes down Lucky’s crew and then goes after the Goblin. The Goblin escapes before being captured by Spider-Man. After unsuccessfully taking over Lucky Lobo’s operations, the Green Goblin initiates an alliance with the Crime Master. In Untold Tales of Spider-Man #25, the Crime Master agrees to ally himself with the Goblin, if the Goblin reveals his true identity to him. Apparently, Norman has already "cracked the [Crime Master's] secrets" and deduced that his true identity is Nick Lewis. Norman double crosses the Crime Master and exposes himself as J. Jonah Jameson. 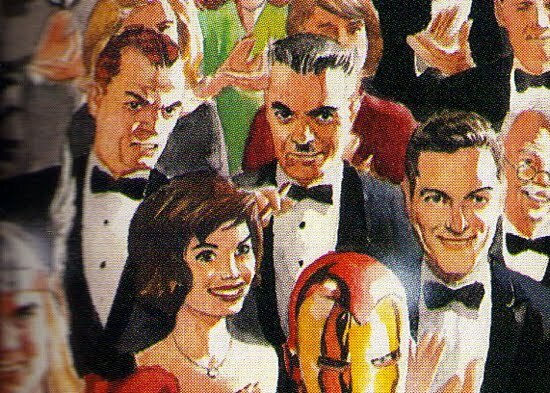 As a quick aside, it is worth noting that around this time, Norman and Jonah attended Reed and Sue Richards' wedding (as seen in Marvels #2). One can truly begin to appreciate just how terrible a person Norman was to intentionally frame his own 'friend' (unless, of course, Norman felt that Jonah was the kind of jerk that deserved this type of treatment...). Later, at a dedication ceremony Norman aids the Crime Master in stealing a Seismic Ray Device (S.R.D.) by creating a distraction. Spider-Man stops the Crime Master and his men but the Green Goblin intervenes to get the S.R.D. The Crime Master feels the Goblin is settling a personal vendetta with Spider-Man and thus no longer wants to keep his alliance to the Goblin. He then tries to kill Spider-Man and the Green Goblin at the same time. The Goblin escapes from Spider-Man and vows to “deal” with the Crime Master who now has the ability to reveal his identity. Norman is pretty astute here because even though he fooled the Crime Master into thinking that J. Jonah Jameson was the Green Goblin, he knows the authorities won't take long to link Jameson to Osborn, and thus the Green Goblin. The incidents surrounding the S.R.D. lead into Amazing Spider-Man #26, where tensions begin to mount between the Crime Master and the Goblin. The Crime Master decides he no longer wants to work with the Green Goblin and that he is going to pursue uniting the underworld on his own. He then begins making power moves at known mobs and when he crosses paths with Spider-Man, the Crime Master is able to hold his own. He exposes Spider-Man to a gas and watches as Spidey falls from a rooftop, he even believes Spider-Man is dead. But, Spidey is able to shoot a webline to stop himself from smacking the ground. 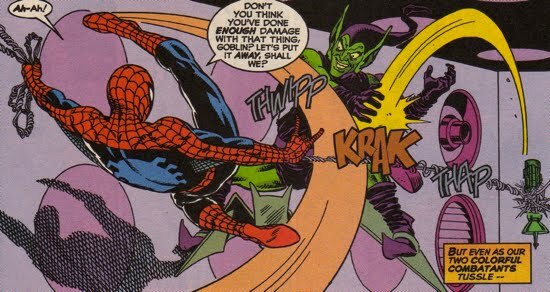 Later, while Spider-Man is following a clue that leads him to a pier, the Green Goblin manages to sneak up on him and deliver a knockout blow with his glider. 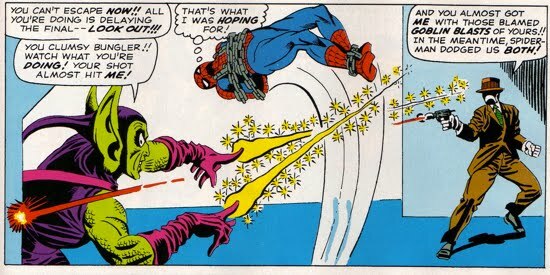 The Green Goblin has a chance to unmask Spider-Man but decides not to, claiming, “There’ll be time for that later!” The Goblin then presents the shackled web slinger as a trophy to the collection of gangsters that the Crime Master had assembled. This issue ends with a tremendous cliffhanger as the unconscious and restrained Spider-Man remains vulnerable to whatever plans the Goblin has for him. In Amazing Spider-Man #27, Spidey is a captive of the Green Goblin, who had just swayed a whole room filled with mobsters to follow his lead. However, Spider-Man soon regains consciousness from the nerve gas he was exposed to and is able to get out of the chains that had bound him. With the help of the police, Spider-Man is able to subdue the mobsters, however, the Crime Master and the Green Goblin get away. But soon after, the Crime Master is caught and killed by the police just before he can reveal the Goblin’s identity. The Goblin is now fed up with Spider-Man and he seeks vengeance upon this man he views as his "most dangerous" enemy. Norman Osborn's goals switch from uniting the underworld to a personal vendetta with Spider-Man. As a very brief aside, this site obviously focuses on the life of Norman Osborn in the 616-Marvel Universe but in honor of due diligence there is always the infamous Spider-Man: Chapter One title. Spider-Man: Chapter One (for a brief period of time) was considered to be the rewritten history of the 616-Spiderverse. This site, and most others, do not treat that series as such, however, some changes to Norman's back-story were written into that title. 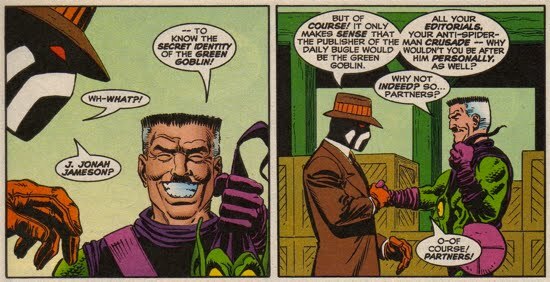 For starters, Sandman and Osborn were second cousins; they shared a great-grandmother (I wonder if she had cornrows too!). 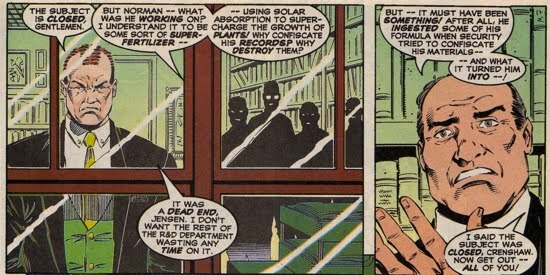 More importantly, Osborn helped to create and manipulate the first wave of villains Spidey faced (e.g., Electro, Sandman, etc). But the main reason for covering this series is that there is a brief scene in Spider-Man: Chapter One #2 in which Spider-Man crosses paths with Norman and Harry Osborn. 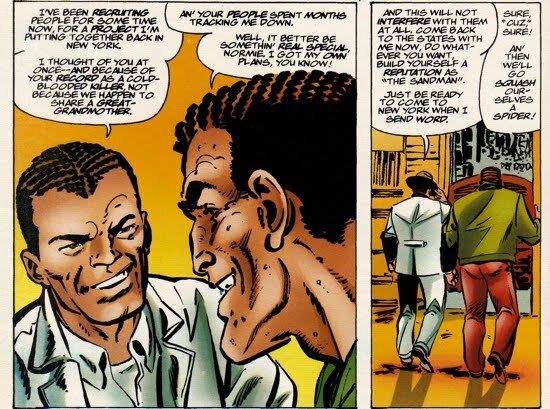 If Spider-Man: Chapter One was still considered 616-canon, this would be the first time Spidey confronted Norman Osborn (not the first time Peter met Norman, they make back in Peter Parker Spider-Man # -1); undoubtedly a landmark event! That is all for now, the less said about Spider-Man: Chapter One the better.